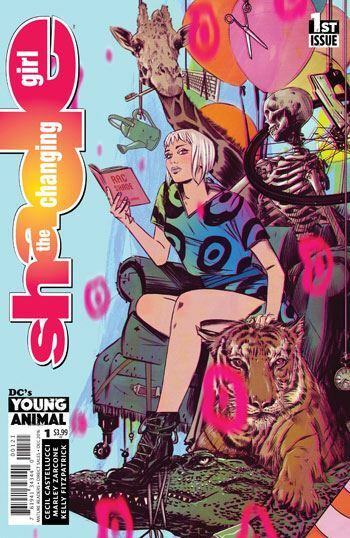 Cecil Castelucci and Marley Zarcone launch an interesting new variation on an unusual hero from DC’s part in Shade, the Changing Girl. Shade, the Changing Man debuted way back in the 1970s, created by Steve Ditko. Rac Shade came from a bizarre alternate reality, Meta, and used the M-Vest to come to Earth. The same vest endowed him with the odd powers he had, to alter his physical form based on his moods. The series was abruptly cancelled mid-story during the DC Implosion. John Ostrander brought the character back in the 80s in the pages of Suicide Squad and resolved the dangling plot threads before sending the character back to Meta. 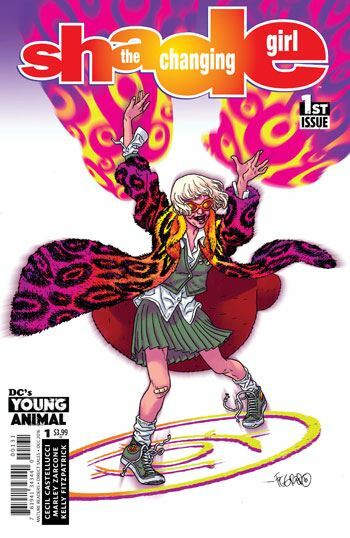 Very shortly after that, a new version debuted under the hand of Peter Milligan. Shade came to Earth, inhabiting the body of an executed serial killer, and began a trek across the US, using the Madness Vest to deal with the loose craziness he encountered. This version had a longer life span, but the series did succumb to a bit too much navel gazing. 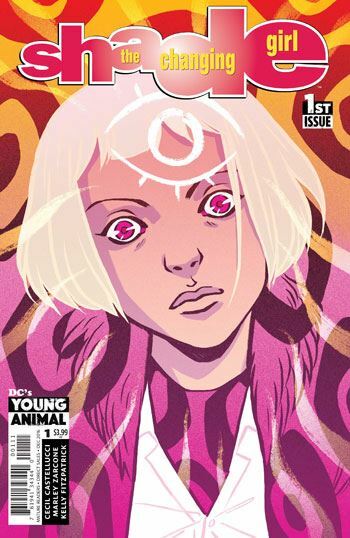 Shade, the Changing Girl acknowledges both of the earlier runs. It centres on a very unusual creature from Meta, Loma, who steals the Madness vest of Rac Shade from a museum, using it to come to Earth and inhabit the body of a nearly dead teenage girl, Meghan. Loma had been a fan of Rac Shade, remembered in Meta for his poetry. One of the poems from the Milligan run is repeated a couple of times in the issue. It was used in “The Road” storyline, and has always been a very evocative piece, beginning “The man has a smile like a pale afternoon.” It’s repeated use in this debut issue makes me hope that it will take on an entirely new meaning in this work. The series also brings back Mellu, Shade’s old girlfriend. She was really only a significant character in the original run, and has aged in the time since then. Mellu is commanding the investigation into Loma’s theft of the vest. The story also begins to develop the character of Meghan, the girl that Loma is now inhabiting. We very quickly learn that Meghan was no angel. She seems to have been an absolute terror, the unforgiving master of her social group. What exactly happened to send her to the hospital will undoubtedly be explored in later issues. At its best, the Milligan series used Shade, The Changing Man to explore notions of identity. Castelucci seems inclined in the same direction with this series. It’s a great start, and I am eager to see where the creative team goes with it.